Samsung took to the stage in Berlin to showcase its new product lineup, and one of the featured devices is the first confirmed Windows Phone 8 device. Dubbed the ATIV S, the new Microsoft-sanctioned smartphone offers a 4.8-inch screen with an HD Super AMOLED display, a 1.5GHz dual-core Qualcomm CPU, 8MP rear camera and 1.9MP front-facing cam. Additionally, it's got a beefy 2,300mAh battery, 1GB RAM, Gorilla Glass 2 and will come in both 16 and 32GB flavors. At 8.7mm, it's also reasonably thin. 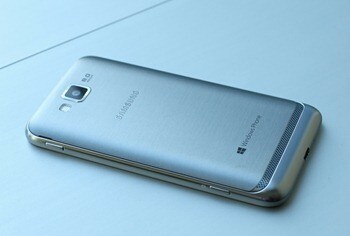 Its body is made of brushed aluminum and comes with a WP8-friendly MicroSD slot. We've got another pic of the ATIV S below, and we'll have a hands-on to you as soon as possible. Check out all of our IFA 2012 coverage at our event hub!